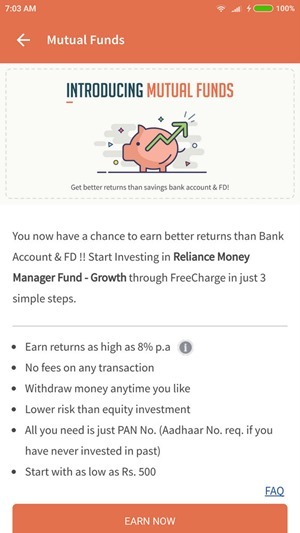 Now, Invest in Mutual Funds Through FreeCharge! Snapdeal-owned FreeCharge is trying to spread it’s wings in order to compete with likes of Paytm and Mobikwik, and have now now come up with an interesting concept that can go up against some banks. FreeCharge customers will now be able to invest in mutual funds through FreeCharge itself, in partnership with Reliance Mutual Fund. Investing money through FreeCharge is a great alternative to savings account or FD to get returns on your idle money. The company says that it will give a return of up to 8% per annum. FreeCharge will invest your money in ultra short-term debt funds which can grow your money faster & give returns of up to 8% p.a. Ultra short terms debt funds invest in low risk or moderately low-risk short duration bonds issued by government and debt funds of highly rated companies. “We will, in future, also diversify in other financial services offerings keeping our customers’ requirements in mind,” FreeCharge CEO, Govind Rajan, said in the statement. FreeCharge also runs another extensive capital lending program called ‘Capital Assist’ which has partnership with large number of financial institutions. Investing in these mutual funds also provides the facility of instant liquidity, allowing you to redeem all the cash instantly. You can link your bank account with the mutual fund accounts, and deposit money instantly, or withdraw and keep it in your FreeCharge account. To invest through FreeCharge, a KYC-enabled customer will have to enter their PAN number, bank account number and a few other details to create a folio. Non-KYC customers can also get their KYC enabled by linking the Aadhaar card with the registered mobile number. There is no fees to deposit or withdraw any amount into your folio. The minimum registration amount is Rs 500 for new investors. However, subsequently, the investors can invest as low as Rs. 100. Is it worth investing through FreeCharge? FreeCharge would help you invest in Ultra Short Term Debt Funds, that are the mutual funds that invest in low-risks or moderately low-risk short-term bonds issued by government and debt instruments of highly rated companies. They have lower risk than equity mutual funds. These funds are a good best investment option if you are looking for higher post-tax returns compared to interest on bank account and FDs. There is an option of easy liquidity and with minimal risk. Even though it cannot guarantee a return, but historical data shows that the returns are better than fixed deposit schemes. There is no lock-in period and you can put your money into this tool anytime and take it out anytime. This gives you higher liquidity as compared to an FD. If you’re not much of a risk taker, and want to start a very small mutual fund, this could be a good path to having one. Reliance Mutual Funds can be good enough, but it is worth noting that different companies have different schemes. You must look around, talk to experienced investors and read online reviews to choose the best. For those who want to get a taste of an MF can definitely start here. "Now, Invest in Mutual Funds Through FreeCharge! ", 5 out of 5 based on 1 ratings. FreeCharge for investing in Mutual Funds. Sounds great, this is a step closer to Digital Indian.